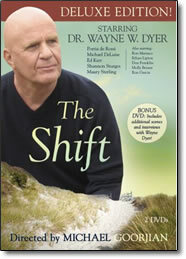 In this compelling film, Wayne Dyer explores the journey from ambition to meaning. The powerful shift from the ego constructs, with their emphasis on achievement and accumulation, are shown in contrast to a life of meaning, focused on serving and giving back. Through the intertwined stories of an overachieving businessman, a mother of two seeking her own expression, and a director trying to make a name for himself, this entertaining film inspires and teaches us how to create a life of meaning and purpose. Join Wayne Dyer and a star-studded cast for a story that will capture your imagination and send you on your own quest for a life of meaning and purpose. In The Shift, we share the stories of three modern lives in crisis. Every life has a turning point, a shift, a choice to make about what really matters.